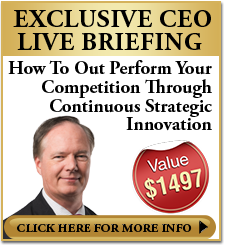 CEOs live in a volatile environment, with changes occurring. A recent study by the CFO Institute identifies volatility as one of the major problems for organisations. If you look at the traditional reporting that you have in a boardroom, you have budgets. Budgets are virtually out-of-date by the time they’re approved. Organisations like Unilever no longer have budgets. They have dynamic forecasts. Every time a new business plan is added into your organisation, the forecasts are adjusted so that the board is always looking at the latest position of the business, not on some expectation that was formed three or four months ago. It’s an example of how organisations need to change their reporting processes to help them to deal with a volatile market. One of the hard parts with a volatile market is that whatever your business plan is, it almost guarantees that’s not what’s going to happen. There are so many factors that will change the business. 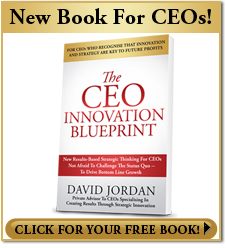 How do I, as a board or CEO, try to ensure that the business will be viable? How do I deal with that when we have to constantly innovate and come up with new ideas? We can’t rely on what’s going to happen down the road. How do you deal with that? One of the things that a lot of organisations are moving towards is to have scenarios and stress testing. The idea is that you don’t have one budget or forecast, that you have multiple, that you take into account multiple factors that occur. You can come up with multiple forecasts to deal with multiple scenarios that could happen. It expands the capability of the organisation to react and come up with ideas and innovations to solve multiple possibilities that could happen over the next two to three years. And whilst we can’t remove the risks that innovations will fail, what we can as a board and management team have is a bit of understanding of how badly it would impact the business if it did go wrong. CEOs and boards have been looking at how they can improve their reporting processes. Balanced scorecards and strategy maps are types of tools that they’re looking at to try and understand the business and the objectives and how they can manage it. They haven’t been as successful as they’d like because they go back to the original problem, which is that they’re basing information on historical information. The strategy map tells you that we’re meeting objectives last month, but it’s not identifying to the board that something’s going wrong with the strategy and we won’t meet those objectives in three months’, six months’, or even two years’ time. It’s very important to start looking at strategy maps not from the historical perspective, but to see if the organisation is going to be meeting the objectives in two years’ time so that you have time to make those changes. That’s what drives your innovation. If you understand that you’ve got a problem in 12 months’ time or two years’ time, then right now you’re going to start thinking about how you can challenge that problem. That’s where the creativity comes up. It becomes the justification for innovation and that drives new ideas in the organisation. But how many of the KPIs in your scorecard are about the management coming up with a new idea? How many new ideas have you tested? How many innovations succeeded or failed? What was the result of those innovations? 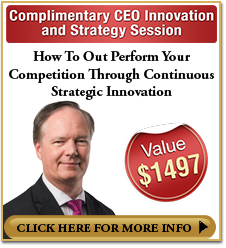 If your scorecards and strategy maps are only focused on measures around performance, such as revenue and sales and operational cost, and you don’t have any performance measures related to coming up with creative ideas and innovation and how that innovation is performing, then don’t be surprised when management doesn’t put a priority on innovation. They put a priority on performance because that’s what you’re measuring them on. Because of the volatility and the demands of reporting that boards and CEOs need that’s very different from the information that you get from general ledgers and ERPs and manufacturing systems, what we’ve built up over the years is arranged on spreadsheet systems. This is becoming a growing threat to organisations around innovation. Spreadsheets have a high risk of error. Studies have identified that there is an average of 90% of spreadsheets in an organization that have errors in them. Now most of them aren’t material. But if you’re making judgment calls on your business and you’re trying to assist innovation and that spreadsheet is wrong, then you can have some major repercussions. As part of becoming an innovative organisation, it’s really important to try and move towards enterprise strategic planning systems and move away from systems like spreadsheets that can create substantial risk to your organisation.